Baggers have been a popular style ever since someone pulled the Tour-Pak off his or her FLHT, chopped down the windshield and grabbed the black paint. The Street Glide Special fits the boulevard-bruiser mold perfectly with Harley’s sleek Batwing fairing that leaves the bottom of the cyclops headlight exposed like a cheek peeking from under the bottom of a pair of hotpants. Below, the front fender carries the full-length coverage needed to control the fling, but the sides are cut back to leave a fairly unimpeded view of the various fancy rims we see throughout the range. This bike has mini-apes, engine upgrades, custom grips, and hi-way pegs. There are several minor blemishes (see photos). This great looking bike is for sale now at Lucky Penny Cycles in Bedford, TX! Come in and take a test ride with us today! Call us at 817-283-1650. IN WHEELS WE TRUST! At the heart of the Tri-Glide lies a 103.1 cu. in. twin-cooled, high output twin cam 103 engine that was tweaked for 2014 to deliver more low-end torque, more passing power, and a throaty exhaust note. 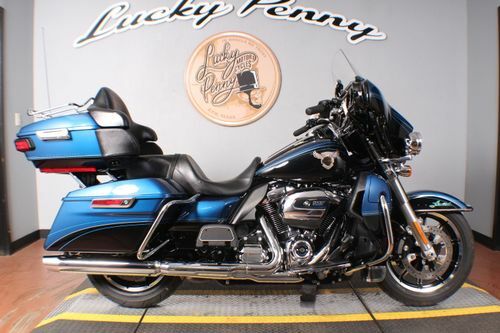 As far as comfort is concerned, the Harley Davidson Tri Glide Ultra has received significant improvements in the passenger space, legroom, airflow and heat management departments. You also get new seat textures, revised backrests, and fresh hand controls. Other modifications were made to the motorcycle’s inner fairing that now features a fresh layout, a bigger display screen, and new gauges. Check out the flying hog ornament on the front fender! There are several minor blemishes (see photos). 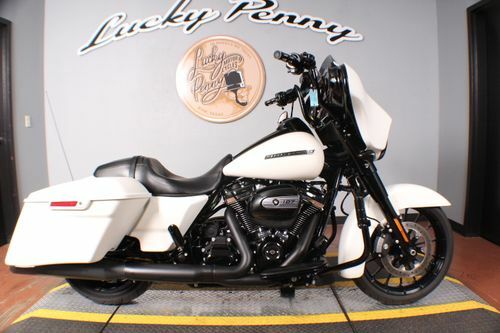 This great looking bike is for sale now at Lucky Penny Cycles in Bedford, TX! Come in and take a test ride with us today! Call us at 817-283-1650. IN WHEELS WE TRUST! The ultimate touring machine. The 115th Anniversary Ultra Limited is built for those who want it all and comes with a limited-edition look. A Touring motorcycle that has it all. From the powerful Twin-Cooled™ Milwaukee-Eight®107 engine right down to the heated hand grips. The unmistakable Batwing fairing and split-stream air vent mean optimal airflow and reduced head buffeting. Premium BOOM!™ Box 6.5GT touchscreen infotainment and navigation allow rider and passenger to ride to any soundtrack they choose. Electronic cruise control, Reflex™ linked Brembo® brakes with ABS, responsive front and rear suspension, a premium Tour-Pak® luggage carrier that can house both rider and passenger helmets, and one-touch saddlebags all come standard. Harley-Davidson Touring Story – Long haul comfort. No restraints. Harley-Davidson® Touring models feature long haul comfort combined with power that will unleash your soul. Spanning decades of heritage and nostalgia, Touring bikes began their lineage in 1936 when the Motor Company introduced a new engine design nicknamed the Knucklehead. From that heritage grew the powerful Milwaukee Eight® engine with more power, comfort, and handling to go the distance, making piling up the miles rewarding and comfortable for both rider and passenger. This is #2613 of only 3700 built. 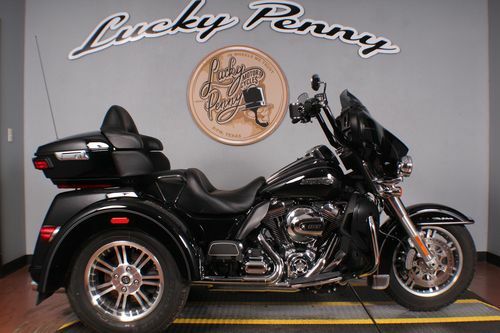 This great looking bike is for sale now at Lucky Penny Cycles in Bedford, TX! Come in and take a test ride with us today! Call us at 817-283-1650. IN WHEELS WE TRUST! It’s now cool to be seen on a trike. No longer is a trike the ride of old guys too infirm to hold up a two-wheeler. Two things excite me about the Harley-Davidson Tri Glide Ultra: it’s a Harley and it’s one of a Harley’s Project Rushmore bikes. The Tri Glide Ultra has Project Rushmore improvements and innovations all through it, from the steering head with stiffer front forks and Twin Daymaker™ LED headlamps and fog lamps in the front, to saddlebags and Tour-Pak luggage carriers with one-touch-opening storage and an integrated trunk in the back. There are several minor blemishes (see photos). 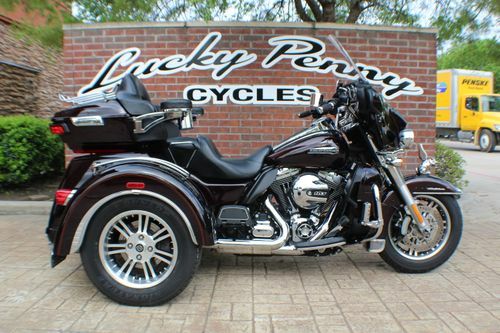 This great looking bike is for sale now at Lucky Penny Cycles in Bedford, TX! Come in and take a test ride with us today! Call us at 817-283-1650. IN WHEELS WE TRUST!